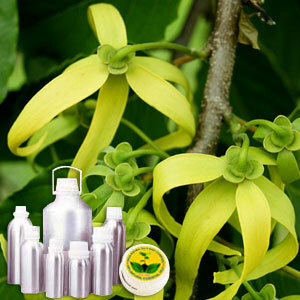 Ylang - Ylang is extracted form Cananga odorata and is valued for its perfumery base. The plant ylang-ylang vine (also known as climbing ylang-ylang) are woody, evergreen climbing plants. The Ylang Ylang CO2 Extract Oil is extracted from the flower part of the plant and fins extensive usage in aromatherapy based applications. linalool, caryophyllene, geranyl acetate, p-cresyl methyl ether, benzyl acetate, methyl benzoate, benzyl benzoate, other sesquiterpenes. Ylang-ylang, ilang-ilang, kenanga, cananga tree, fragrant cananga, Macassar-oil plant. Ylang Ylang CO2 Extract Oil has euphoric & sedative effect on nervous system and helps to overcome anxiety, shock, tension, fear & panic. Its aphrodisiac qualities also make it useful for impotence and frigidity bodily disorders. It is also particularly useful with cases of rapid breathing & rapid heartbeat, where it helps in reducing high blood pressure. Further, it is also useful for intestinal infections.It also has stimulating effect on scalp and helps in promoting more luxurious hair growth.